When I was a growing up, Funfetti cake mixes were always my favorite. Funfetti is a type of cake mix made by Pillsbury where rainbow colored sprinkles are stirred into a white cake batter to give the finished cake a colorful, fun look. Those splashes of color really won me over and Funfetti was always my first choice when it came to birthday cakes. 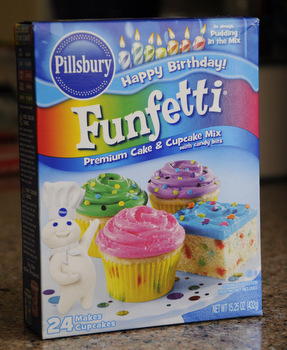 Funfetti is actually celebrating it’s 25th birthday this year, and Pillsbury asked me to join in their celebration with some Funfetti-inspired baking, and provided me with a big box of baking mixes to play with. 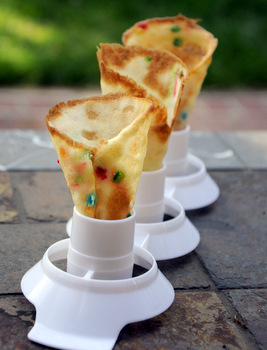 As a Funfetti fan, I wanted to pay homage to the cake mix that I loved as a kid, but just making the mix straight from the box isn’t quite as exciting to me these days, so I turned it into something completely different – but still birthday-party worthy: Funfetti Tuiles. Tuiles are thin, buttery wafer-like cookies that get their name from their curved, tile-like shape (since “tuile” means “tile” in French). 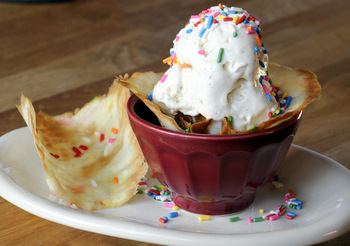 Tuiles are baked flat, like other cookies, and are shaped by hand when they are still warm from the oven. This means that you can easily twist them into different shapes – such as wafer cookie bowls and small ice cream cones – as well as the classic “tiles”. My Funfetti version starts out with a box of Funfetti cake mix, rather than a classic tuile batter, so the finished cookies are a lot more colorful than you would get with a standard recipe! The tuiles are crisp and buttery, with a slight vanilla flavor from the cake mix. The Funfetti sprinkles added a lot of color and made the cookies seem very festive. I turned some into classic, curved tuile shapes. 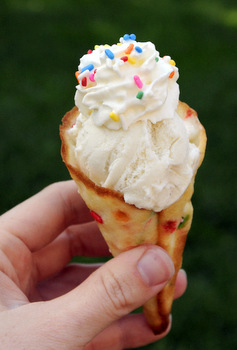 Others, I rolled into small ice cream cones or pressed in to empty muffin cups to form crisp bowls to hold ice cream. You don’t need a whole box of cake mix – just one cup of mix for a large batch of tuiles. Egg whites, sugar and butter are added to get the batter to the right consistency, then the tuiles are shaped and baked. Most tuiles don’t include leavening, and since cake mix does, you need to take extra care to make the tuiles as thin as possible before baking them to ensure that they turn out to be crisp and buttery. To achieve this, I used a slightly unusual technique. 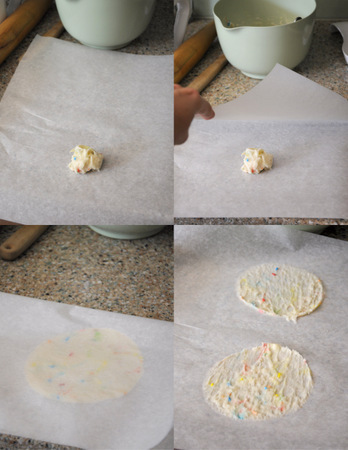 I placed a small dollop of batter on a piece of parchment paper, folded the paper over and pressed it out into a very flat circle, then unfolded the paper. The tuile might appear to be too thin before baking, but it actually filled out into a perfectly crisp cookie with this method. It takes very little time to make the tuile batter and they bake very, very quickly, but they need to be baked in very small batches (two or four at a time) because you need to shape them while they are hot and pliable. That said, don’t worry if your first few don’t turn out perfectly. You can actually pop the tuiles back in the oven for a few seconds to soften them before re-shaping if necessary. The tuiles should also be served within a few hours of making them to ensure that they are crispy. In a large bowl, beat egg whites until slightly foamy. Add in cake mix, sugar and melted butter and stir until very well combined. 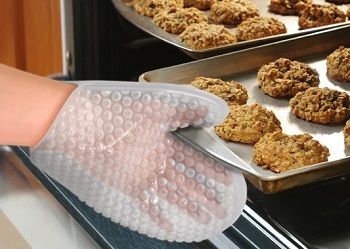 Place a sheet of parchment paper the size of your baking sheet on the counter. Place one tablespoon of batter on half of the parchment paper, then fold the paper in half, covering the batter. Press the dollop of batter (through the parchment paper) out into a large, very thin circle. Peel the parchment paper apart. The circle of batter should be so thin that you can almost see through it (see photos above for examples). 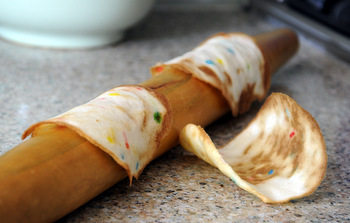 For a u-shape: Drape the tuile over a rolling pin. 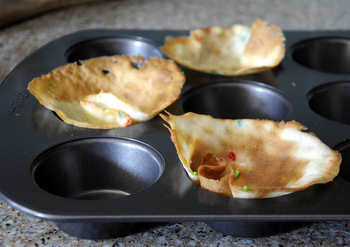 For a bowl: Press the tuile into a muffin cup and allow to set. For a cone: Twist into a cone shape and hold for 30+ seconds until the cone starts to hold its shape. For a tube: Roll into a small tube and allow to set seam-side down. If tuiles become too firm to mold, simply pop them back into the oven for 20 seconds to soften them. Allow to cool completely before using. If you want to get in on the Funfetti celebration, head over to the Pillsbury Facebook page to check out their great giveaway promotion going on until April 25th. 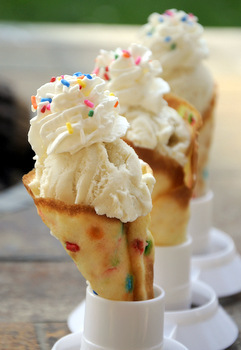 I want to make this so bad, but sadly where I live it’s still a little bit to cold, to make ice cream. Not to mention I have everything to make coconut cream pie and angle food cake.